Unsure about the benefits of EPoS software? Or it's suitability for your business? Why not see a demo of ICRTouch till software for free? 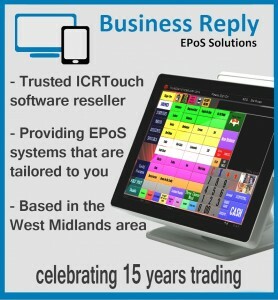 ICRTouch software EPoS from Business Reply…. a touch of genius. An ICRTouch software free online demo can be yours just by contacting one of the friendly team at Business Reply. For all things EPoS Business Reply are the people to contact. Based in the West Midlands they supply EPoS systems to many big names and independent stores throughout the area but can also offer support and knowledge to anyone who has ICRTouch software on their EPoS till. Seeing is believing and that is why the best way to see what benefits can be gained from the really modern and effective ICRTouch software is to ask for a demonstration. Not all till software is alike and whilst there are lots of good versions available it’s is often the less effective software that we are called out to replace with more efficient solutions. Business Reply supply ICRTouch software because they believe in the many benefits it gives alongside backing from a progressive and supportive technical development team. Business Reply want to give your business the best products and service and with ICRTouch we know with confidence we can do so. ICRTouch has been developed over the years to give a robust and yet easy to use software solution for EPoS tills. The software is intuitive and can meet all the needs of the modern business from cloud computing to multi channel selling and customer loyalty operations to cashless sales. And if you don’t need wizardry but just good common sense EPoS to meet your needs – then it covers that too with confidence. But…no matter how many words there are to describe the features there really is only one way to appreciate the specific benefits to your business – so don’t be shy give us a call or drop us an email today and we’ll contact you to arrange a free no obligation demonstration online. ICRTouch software free online demo from Business Reply – invest a little time to help your business big time!